Karamba have been enthusiastic players in the online casino market for some time, now. Their colourful, friendly site has been a real hit with online casino fans from the moment it appeared on the internet, plus the levels of gaming and customer service experienced there have been seldom less than exceptional. 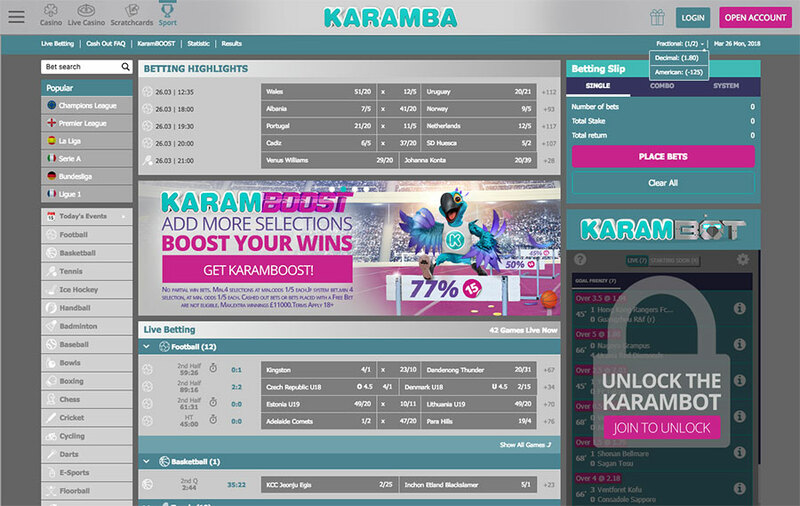 Now Karamba have extended their empire to include a rip-roaring sports book, which should be excellent news for sports betting fans everywhere. 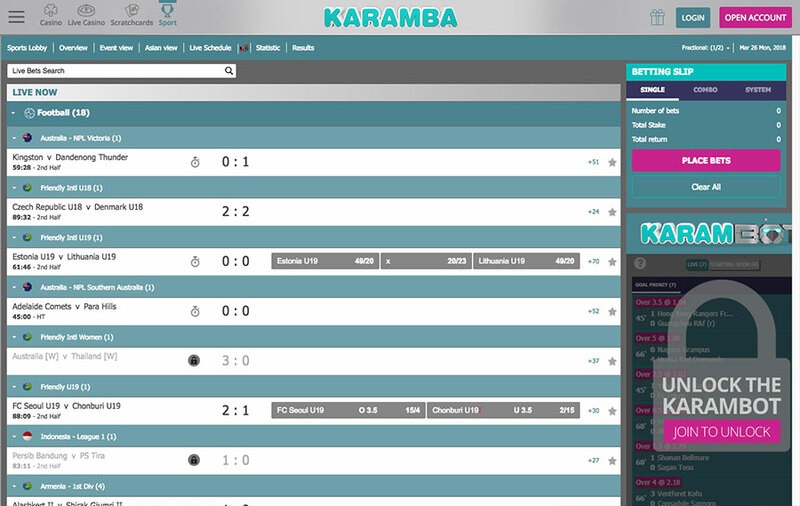 The Karamba sports book is owned by ASG Technologies in Malta and possesses licensing via the Malta Gaming Authority and the UK Gambling Commission. 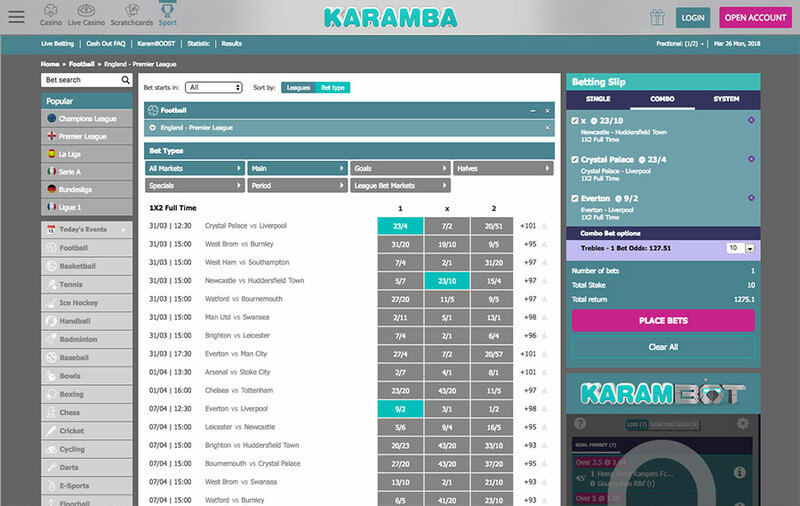 If you're a new customer at Karamba Sports then you can earn yourself a nifty little bonus just by signing up for an account and depositing and then placing a £10 bet – if you complete all the bells and whistles of this offer you will then receive a £10 free bet to use how you wish! To gain your freebie just place a £10 bet once you have completed your registration on any single market event at minimum odds of Evens (2.00). Once your event has finished, whether it is a winner or a loser you will earn yourself a £10 bonus bet. Note that this offer is only open to customers from the UK, Sweden, Norway, Finland, Germany, the Netherlands, Switzerland, Austria and Canada. Please don't use Skrill, Neteller or Paysafecard when making your initial deposit at the site else you will not receive a welcome bonus. Your welcome bonus bet cannot be cashed out, but you can cash out any winnings you make from it. Your free bet can only be used on events with single or combined odds of 4/5 (1.80) or higher. Even as a regular customer you can get added value on your dealings at Karamba Sports with their 24/7 'Karamboost' offer. To get the most out of this deal you need to choose at least four pre-match sports selections and place an accumulator bet with combined minimum odds of 1/5 (1.20). If your acca comes in, then Karamba will give you an acca boost of up to seventy-seven percent! The boost starts at four percent for four selections, and rises on a sliding scale up to that maximum seventy-seven percent boost for fifteen or more selections! You certainly get more for your acca cash at Karamba Sports than you do at most other sports books! Live betting on events in play is available at all times, and cash-out is available on most events. While the casino side of Karamba is lively and colourful, the sports betting side is a little more serious and refined, which really is how it should be. If you're a sports bettor you don't want a dancing parrot to go prancing across your screen as you're studying today's form! The design is concise and the grey and blue colour scheme (with a touch of pink) works exceptionally well. The menus are easy to use and all the best betting options appear in the centre of your screen so you can really keep an eye on just what is going on. The right side is given to your betting slip and suitable offers that are likely to interest you. You cannot bet without money, of course, so it's a good job that Karamba gives you plenty of ways in which you can fund your sports betting account. There are several ways of getting money into your Karamba account, from Visa and MasterCard credit and debit cards to popular eWallet solutions such as Skrill, Neteller, Paysafecard, Sofort, Trustly, Neteller, GiroPay, Euteller, Zimpler and InstaDebit. You can also transfer cash directly from your bank, and all deposits are processed instantly. Withdrawals are all available via the same methods (except Sofort, Trustly and a few other eWallets) and take around three (Skrill, Neteller) to eight (credit and debit cards) days to process. To be honest, we'd like to see those times speeded up a little. There's no doubt that Karamba Sports is a sports bettors paradise. While their casino arm has been created with fun and frivolity in mind, the brand have recognised that sports betting is regarded as a more serious affair and have tailored their offering accordingly. Karamaba Sports is an excellent site to use, all round. If you're really into your acca as a way of scoring big on the old sports betting front then you'll score even 'bigly-er' with Karamba's acca boosts. In short, we like Karamba Sports, and we like it a lot!